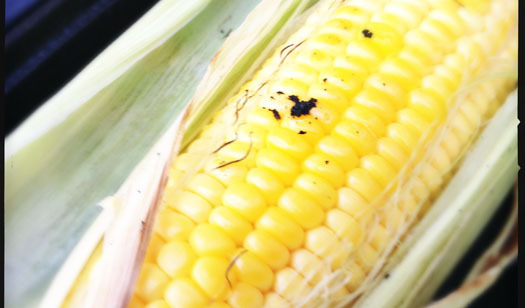 How to cook sweet corn on the cob in a fire. Get your corn and soak it for 20 minutes in clean cold water. The husk will soak up some of the water and protect the corn from burning. Skewer your corn on the sharpened stick and place over the campfire. The wet husk will help steam the corn inside. It will take between 15 – 25 minutes to cook the corn this way, and will taste the least of campfires. Peel off the outer shuck to leave only the silks, and soak again for 20 minutes. Skewer onto your sharp stick and cook over the fire for 15 minutes turning frequently. This method tastes more of the fire, but should be still very sweet. This is the smokiest way of cooking the corn over an open campfire, and my favourite. Just peel the corn, skewer onto the sharp stick and keep turning until it is cooked after about 15 minutes. Tastes really nutty and full of flavour. You will also end up with the dirtiest face too. Peel your corn and make a wrap of tin foil. Place a knob of butter and a dash of salt into the foil before sealing. Place on the embers of the fire and it should cook in 15-20 minutes. Buttery, sweet and delicious.